SnowFit is an employee health and wellness program that combines the benefits of step counting and education on healthy lifestyle choices, with motivational and inspirational support at the workplace. A feasibility study was conducted when it was determined that funding for the new program was available. This study concluded that the program had the potential to be virtually self-sustaining. Program development involved negotiating five major items that were critical to the success of the program. A survey was conducted to validate the direction, community health experts were consulted, processes were put into place, and social platforms were created for communications and daily management of the program. Marketing, program theme, challenges, rewards, and the overall program were prepared for launch within 33 business days. Stats of engagement were much higher than expected, yet financial commitments ended in the black. Due to this high participation rate, people are moving more, thinking and learning about how their choices affect their health, and seeing real results. This momentum will carry the program forward to benefit students at the college as well as its employees for years to come. SnowFit is a hybrid program that provides employees added benefits at little or no cost to the college. Essentially, this program has the potential of providing increased employee workplace satisfaction, improved physical health, and additional benefits that can potentially save the organization money in avoiding attrition and employee sick days while growing employee workplace environment satisfaction. This program enhances potential productivity while also engaging the relationship between the college and its local community. SnowFit utilizes both intrinsic and extrinsic motivation to leverage the greatest results. Some of the areas this program focuses on are: enhancing community involvement; providing benchmark opportunities; and supporting competitions, challenges, and rewards. The specifics of this program were presented in Chicago at the Innovations Conference in 2016. Since then, several community colleges have committed to developing similar programs in their towns to benefit employees and their company cultures. 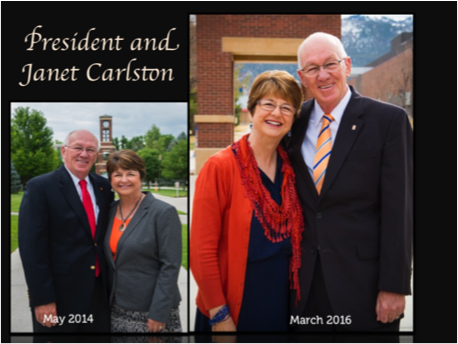 Snow College is situated in two small rural communities in central Utah that have a population of 6.4K and 7.5K. Although some of the faculty and staff travel from as far as 187 miles to work for the College, many live in beautiful Sanpete County. Because of Sanpete County's environment, the overall health and wellness of employees at Snow College may already be ahead of the curve when compared side by side with employee health statistics from across the nation. Nevertheless, many studies have shown over the years, and leave little room for doubt, that increases in risk factors such as negative personal health practices (eating, exercising, sleeping, drinking, smoking, coping with stress, etc.) have a direct correlation on workplace environment, productivity, absenteeism, and associated health care costs to a company. Therefore, it is the mission statement of SnowFit along with the Wellness Council “To motivate and inspire employees to MOVE, THINK, and LEARN”. Snow College is comprised of two campuses. The main campus in Ephraim has an activity center (AC) available for employees and the community, but the Richfield campus (53 miles away) does not. The number of employees who were currently paying to use the AC was obtained. For purposes of this study, a slightly higher participation rate (31 – 35%) was calculated in the report in anticipation of the new-program buzz and the excitement factor that would be created. For those on the Richfield campus, the estimated participant percentage was calculated at the cost of the local gyms. The proposal also included an estimated number of spouses that might participate and developed an algorithm to adjust with actuals as they came in. Various step-tracking devices were considered and a bidding process was followed per College policy. FitBit was selected because of the discounted corporate rate and service package they offered. The Wellness Council and others determined that a $5/mo participation fee was reasonable. This money was used to pay for a portion of the Fitbits. 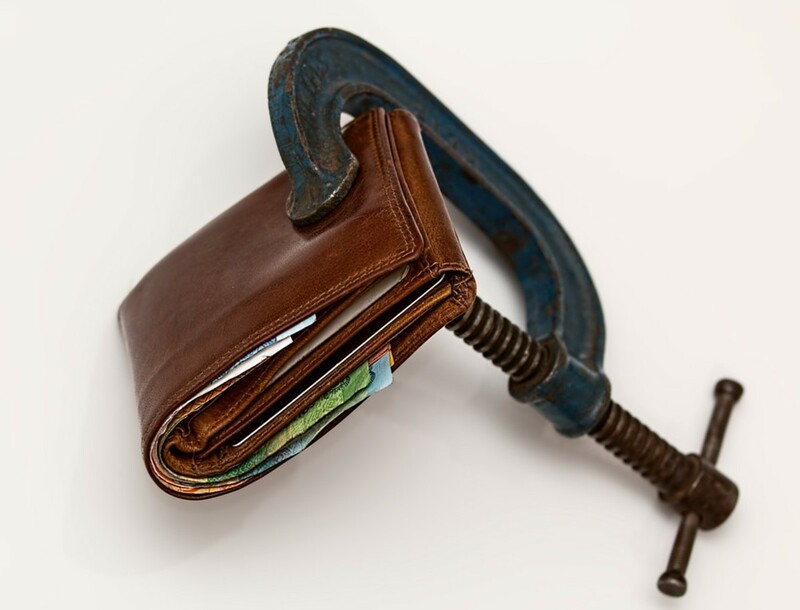 SnowFit funds covered between 26-47% of the cost of the trackers depending upon the product employees selected. The first step in this area was to seek approval from College Administrators. After meeting with the Vice President of Finance, and through approval from the President, the program was given a budget. From the start, the President was very supportive and excited about the proposed program. Having secured approval for the funding, the next step was to meet with the other Administrators individually to get their buy-in. The support was overwhelmingly positive. Conservative cost estimates and participation rates were helpful in the beginning, but it was important to also calculate strategies to ensure future financial program sustainability, innovative theme development, comprehensive interest levels, effective engagement, and methods to support motivation activities and practices. Several important aspects of the success of this program were negotiated. First, the President approved access to the AC to be free to all employees – full time and part time alike. Second, the FitBit corporate discount price was 15% off of retail costs. A bidding process was required. FitBit easily won the bid by offering corporate discount prices, customer support services, and online community features that proved to be paramount to the success of the program. Forth, it was determined that this program could be offered to part time employees and their spouses since it wasn’t technically classified as a “benefit”. Fifth, a discounted gym membership for the Richfield campus was negotiated at two local gyms. Our participating Richfield employees paid a comparable rate to the employees located at our main campus, but SnowFit only reimbursed the gyms based upon actual attendance. This practice helped put SnowFit in the black. SnowFit worked with the HR department to develop new payroll deduction forms to accommodate both campuses. Other collateral and promotional pieces were designed, i.e. 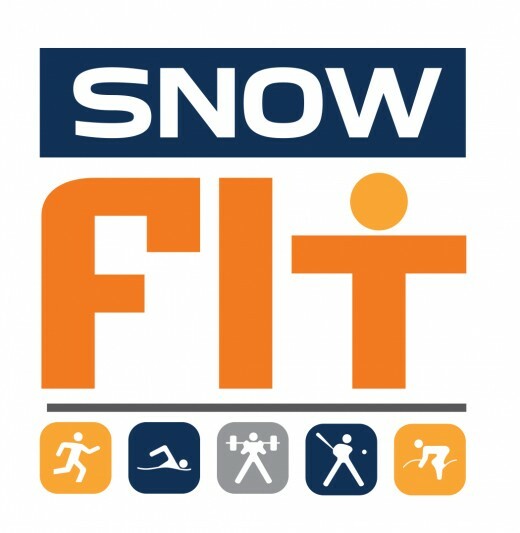 the name “SnowFit”, our logo, FitBit ordering forms, instruction sheets, etc. The initial program limited the type of step-tracking devices for ease of ordering. The school colors were selected (orange and blue), and also the option of black in three types of devices. Meetings were held with the manager of the cafeteria to discuss plans to develop incentives for healthier food choices, i.e. 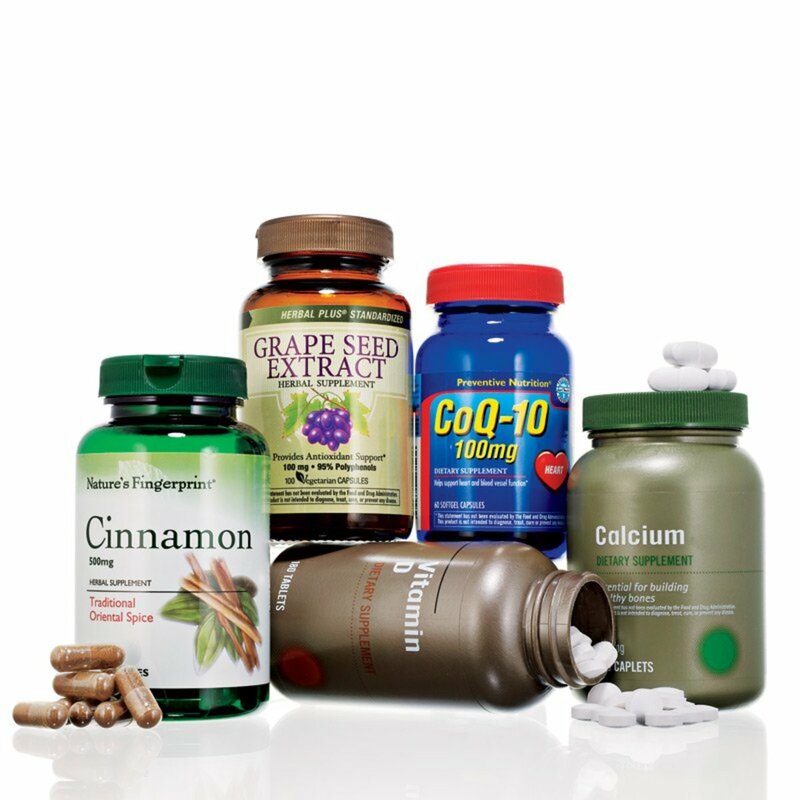 “SnowFit Approved” foods that participants could get for a discount. Health ratings are currently being used on food services signage, i.e. “low fat”, “low calories”, “low carbs”, etc. Themed menu weeks and other healthy food choice ideas were also discussed. A Canvas course was created to reach those who are motivated by assignments and due dates. It also provided a forum for personal body measurements and photographs to be submitted. Incentives were offered for participation, and the “online class” was made available to all participants. A Facebook group page was developed to provide a private social media support system. It would become a place for encouragement and camaraderie. It also was designed to be a place where participants could share recipes, motivational quotes, and serve as a reminder to participants about things that were going on. Several platforms were created to facilitate social support, privacy of information, and dissemination of information, i.e. a Canvas course with assignments and due dates, Facebook group page, Google docs for tracking engagement, and for sharing implementation responsibilities. A point system was created to motivate those who are extrinsically motivated. Points were awarded for signing up, participating in the weekly challenges, connecting on our platforms, sharing substantial posts on Facebook, submitting assignments on Canvas, participating in local community health events, attending classes and lectures, participating in various benchmark activities, weigh-ins, etc. Online research revealed the details of how other companies had implemented “Biggest Loser” competitions in the workplace. 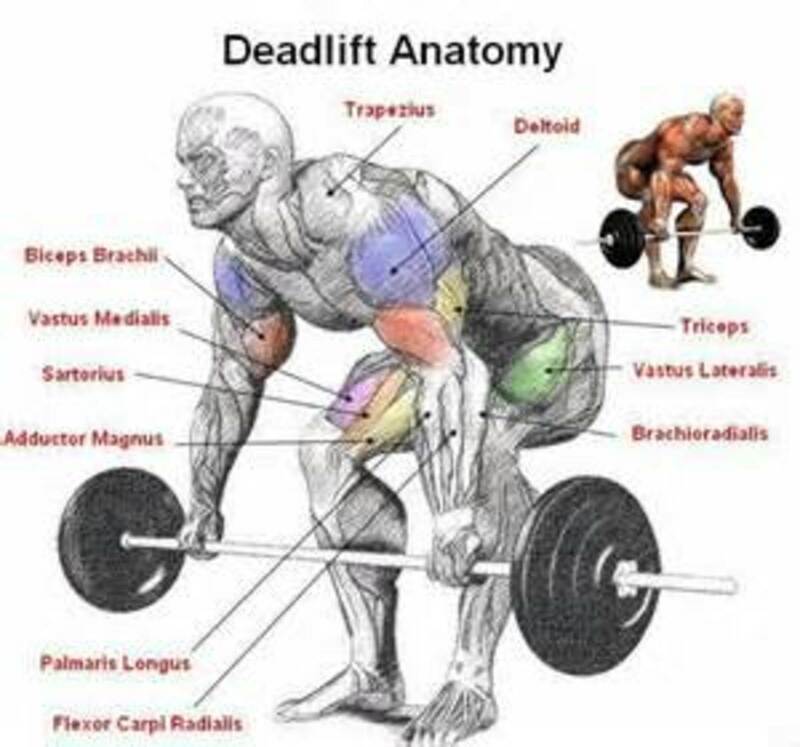 Two tracks were created to help reach a large variety of people and their needs; one for weight loss, and the other for strength and endurance. Other factors such as bi-weekly weigh-ins for accountability, beginning and ending photos were also incorporated into the challenge. The following routines were used as a benchmark measure and conducted at the beginning of the program, and again at the end so participants could see improvement. Orange Track: Weight loss = 1 mile walk/run. Blue Track: Strength/Endurance = Timed 1 mile, 100 push ups, 100 sit ups, and 100 air squats in any order. Cross-departmental encouragement, friendly competition, and proud posting of results contributed to the successful momentum of this new program. As each team crossed the finish line in New York City, they received a specially designed T-shirt that said “We Made It!” The first teams in each category also received gift cards to one of four locations. Studies show that a Biggest Loser competition in the workplace should not last more than 12 weeks. At that point a new set of challenges was required to take its place. SnowFit evolved and created an element from the sponsoring insurance company: PEHP Monthly Programs and Incentives – CASH4YOU! SnowFit incorporated the monthly themes from the insurance provider by creating challenges that support their programs. Because the insurance benefits are only available to full-time employees, SnowFit augmented PEHP cash incentives in order to offer these additional cash prizes to both full-time and part-time employees who wish to participate in the program during the summer months. A traveling gag trophy was created by wrapping large old trophies in foil and labeling them: Most Steps – past 7 days; Second Most Steps – past 7 days and Most active minutes – past 7 days. One employee, Armando in the facilities office, logged over one million steps each month for 9 consecutive months. 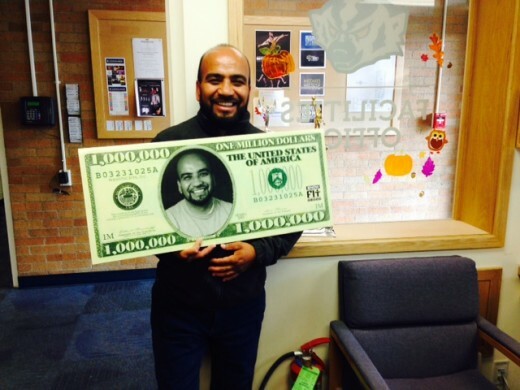 Armando was rewarded with a $1,000,0000 bill with his face in the center and a $10 gift card to Wal-Mart each of these months. As the program developed, two tiers emerged. The “Movers and Shakers” (top 72 participants) and “A-Team” (72+) to provide the opportunity for more movement from these trophies. 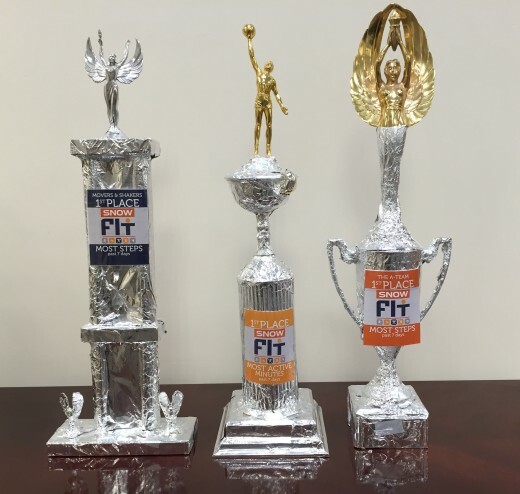 The resulting discussions from employees who proudly displayed these trophies at their work areas were evident of successful motivation and engaged participation. Armando logged 1M steps per month for 9 consecutive months! Potter and Gold were invited by the president of the College to present this new program at the employee welcome-back assembly. Special visits were made to present the new program to departments, divisions, and other office across campus to ensure that every employee had been invited to join “SnowFit”. A flyer was prepared and handed out in water bottles (imprinted with the SnowFit logo) to employees on both campuses. This flyer would also be included in all new employee packets going forward. Signage on campus that first week (“How Many Steps” A-frames) created buzz and drove interest with employees and students alike. Community health events were perfect opportunities to promote healthy lifestyle activities, offer benchmark measures for future motivation and recognition, and helped to build unity in the community. Examples of these are: Chiropractic Health Expo, several 5K runs, Two-week Tri-Athlon, body scanning discount at a local clinic, etc. Even with almost double the anticipated participation; total operating expenses are currently at only 52% of the anticipated budged amount. 57% of participants make comments or post information online. The stats of engagement among participants (as measured by the opening of our emails) far exceeds all industry standards in the field of education. The next two years will have different themes so a rotation of theme ideas can be anticipated. This will also allow the program to be easily run by others on the Wellness Council if desired, and eliminate the need to continually re-create the program. The Amazing Race & Walk Across America. This will highlight team-focused challenges with mini-events throughout the year. There will be one major event-race at the end of the spring semester. A pilot program with two Fitness and Wellness classes is being planned. A public school tried this with great success. Students may purchase a FitBit instead of a book. Instructors will manage challenges and incentives by using the training materials and suggested challenge lists we provide. They may elect to construct their own goals and challenges, even connecting their expectations to the student’s grade as motivation. Revenue opportunities are greater with this avenue. Where the corporate discount is 15%, FitBit currently offers a 20% discount to students. Furthermore, possible federal grants could be available when this type of program is offered to students. These options are presently being investigated. Finally, SnowFit plans to negotiate and promote healthier snack choices on both campuses. Target areas include the bookstores, kiosks, and impulse racks offering options for those who would make a better choice if the option were available. A sticker with our logo and “SnowFit Approved” may be used to help students identify the optimal choice. Next fall semester, SnowFitwill have a new webpage. FitBit device ordering will take place online. Payroll deduction forms, weekly challenge information, articles and recorded lectures on health topics, and other related resources will be easily accessible in one location online as well. The Canvas course will probably go away, and the participation points system will offer fewer points in order to give more value to each credit. One option is to have a Google doc spreadsheet with sheets created for each individual. They fill in their own points, and the totals are calculated linked to a summary page that everyone can see. Their names would be replaced by a code or numbering system on that page for confidentiality. A new introductory video is being created to post on the website, and to use at the opening assembly this fall. A celebration will be held at the end of the year with an awards luncheon. Prizes will be awarded at that time with either of these two scenarios: more participation = more chances to win prizes in a drawing; or assigned prizes will be awarded based upon participation and % of improvement in benchmark measures. All participants are rewarded for their participation, but those whose health achievements stand out will be recognized. It is clear that healthier employees equal a cost savings for the college. Whether it is calculated as less sick-leave taken, cash kick-backs from insurance agencies, government grants and incentives, or simply higher productivity, the outcome is substantial. With funding received from insurance incentives, employee participation, and discounted goods and services, this program has the potential of accruing virtually no cost to the college. The synergistic motivation and peer support witnessed at Snow College was wholly unanticipated. A comment from one of the employees on the facilities team was that they were glad the rest of the faculty and staff could finally see how much they do for them. Another said that it was the first time their department actually felt like part of the team. 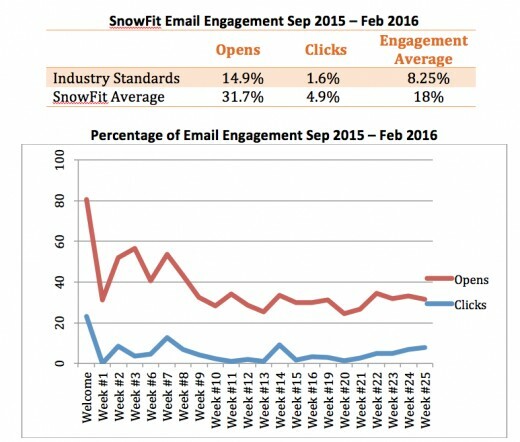 SnowFit’s challenges and rewards clearly improve the workplace environment. Community involvement increases the sense of belonging and unity. 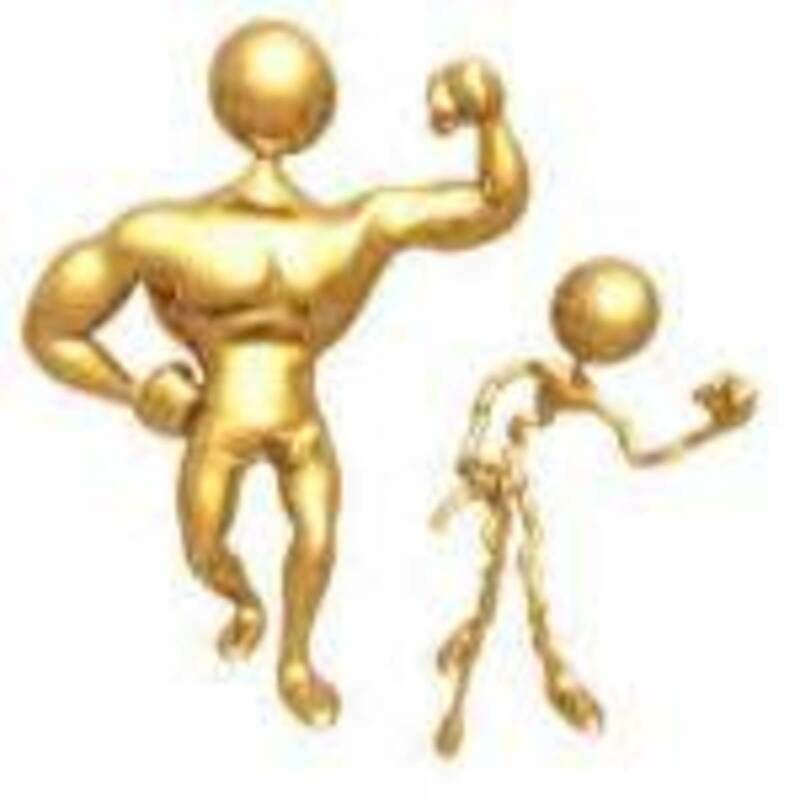 All motivational types are satisfied, whether they are intrinsic or extrinsic. Whether the step-tracking devices and this program simply provide a glorified “string around the finger” or not, there are certainly more smiles on both campuses. People are moving more; they are thinking more about their health; and they are learning about how the choices they make affect their physical health. Therefore: SnowFit mission accomplished. Qualified health insurance and federal programs incentives may be necessary. In Utah, it is PEHP (Public Employee Health Plan). Shain, M., & Kramer, D. (2004). Education: Health Promotion in the Workplace: Framing the Concept; Reviewing the Evidence. Occupational and Environmental Medicine, 61(7), 643-648. Retrieved from http://www.jstor.org/stable/27732309. A division of Utah Retirement Systems, PEHP (Public Employee Health Plan) is a nonprofit trust serving only the public sector, the State of Utah, its counties, cities, school districts, and other public agencies. Wording of memorandum offering employees 90-minute lunches in order to exercise can be made available upon request. Retrieved 6/16/16 from http://corporatefitnessleague.com/, Retrieved 6/16/16 from http://www.livestrong.com/article/359849-ideas-for-biggest-loser-in-the-workplace/.